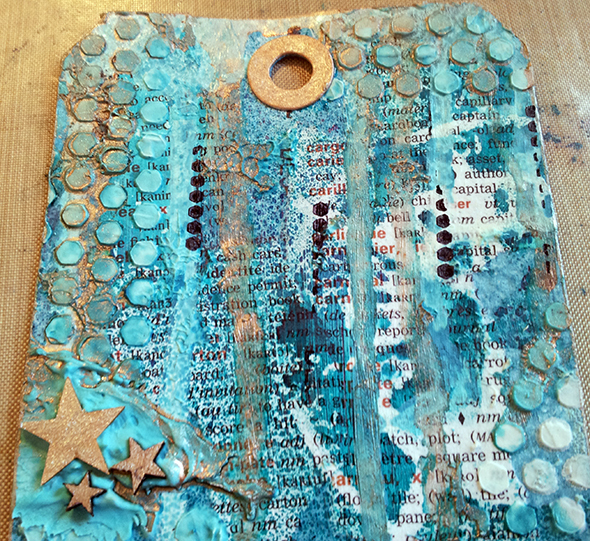 Nicole here today to share a how to of a mixed media tag I made. I know a lot of people love this style but feel that they won’t be able to do it. 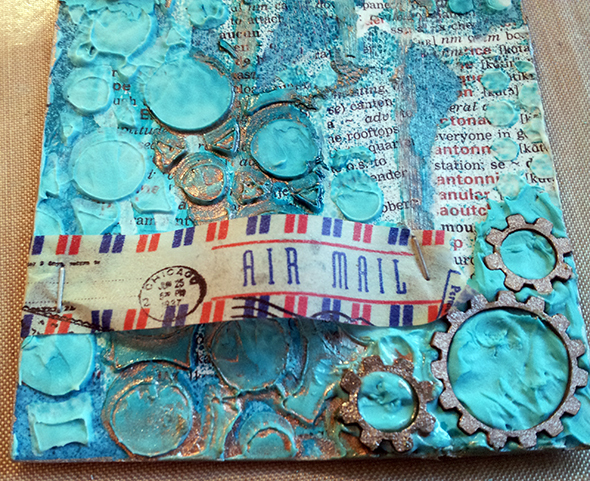 I wanted to show you how easy it is to put together a mixed media piece. Apologies in advance for all the photos, but I wanted to make sure to illustrate every stage! Gloves if you don’t like your hands getting messy! Anything else on your craft desk you think you may like to throw on your tag! 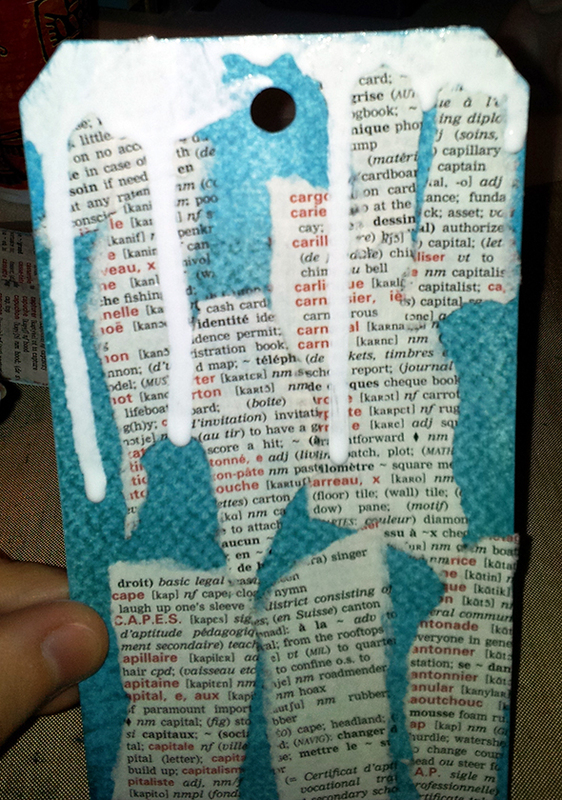 I used my oil pastels to scribble colour in different shades on my tag base. I then blended this with water and heat set it in order to sink the oil into the paper. You could paint, ink etc at this stage. I like the oils as once they are heat set they don’t move, smear or bleed colour again. Rip up some book or magazine paper. 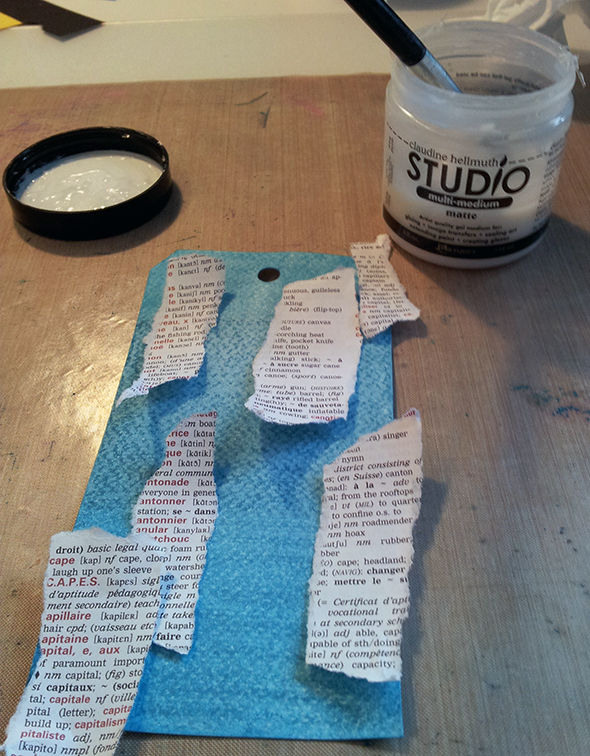 Using gel medium glue the scraps down randomly. 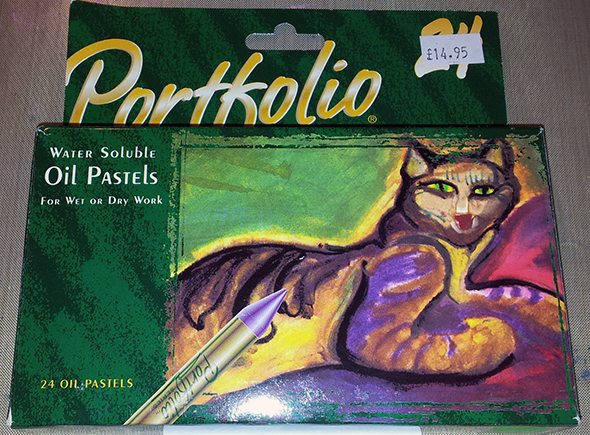 Seal over the top of them too with the gel medium. 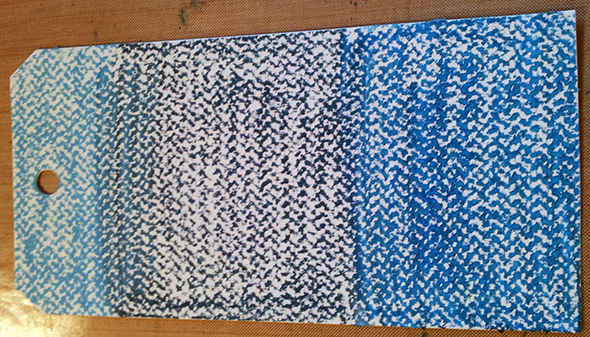 Dilute some acrylic paint – I used white. Use a paint brush to paint this onto the top of the tag and hold the tag upright over your craft sheet to let the paint bleed downwards. I used a mask and placed it on the tag and spritzed over it using Glimmer Mist. You could use more than one mask at this stage if you liked. 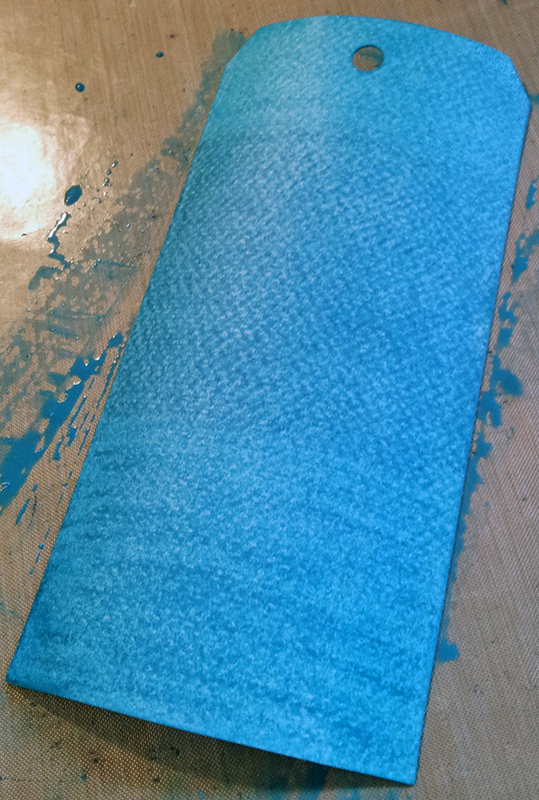 On a plastic surface I put down some white texture paste. 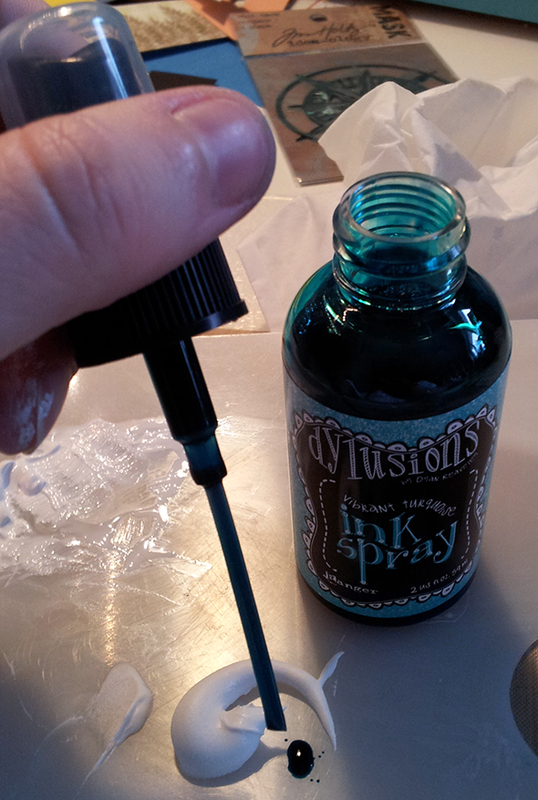 I then added a few drops of turquoise ink from a Dylusions bottle to tint the paste. 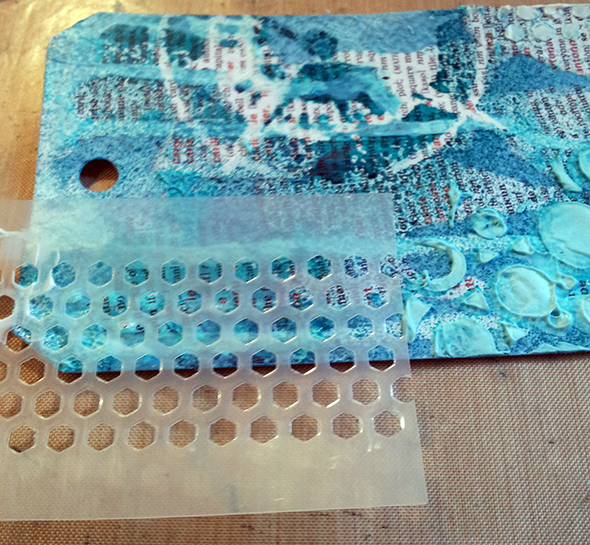 I then used this paste on my stencil. 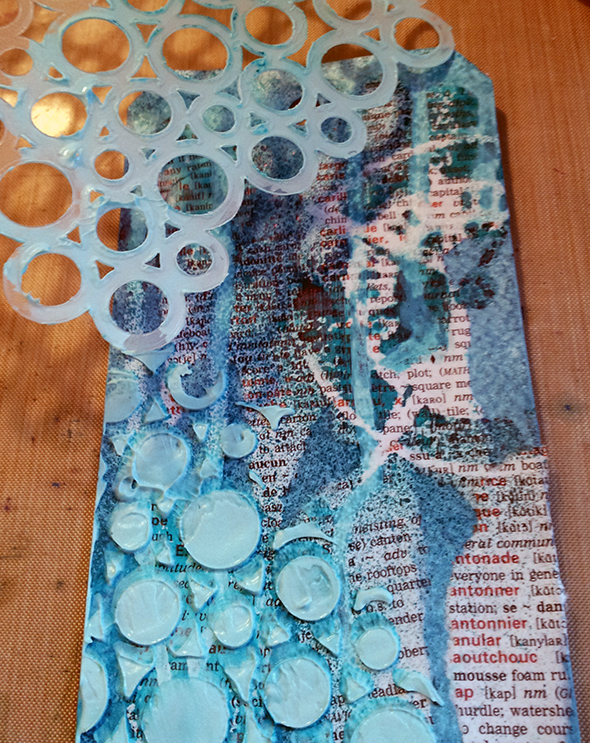 Its a bubbles stencil from Studio Calico. I also use a little hexagon stencil I made myself using some stencil plastic and a die. 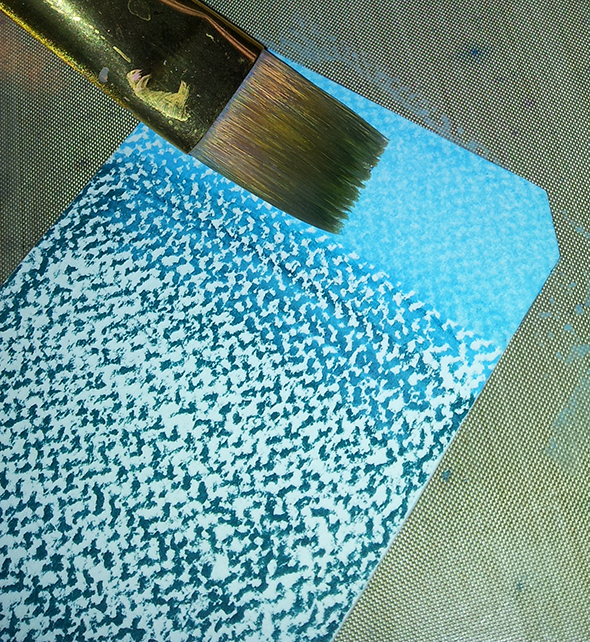 I stenciled through this stencil using some of the tinted paste and some of the natural white paste too. 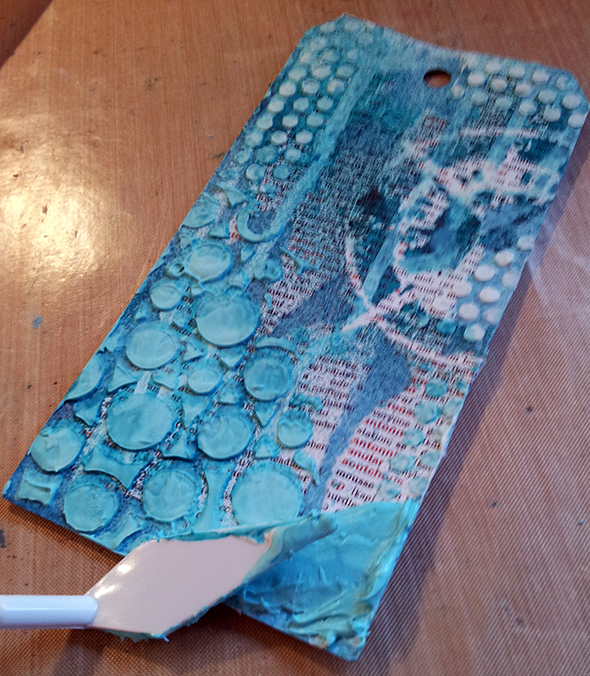 I used a pallet knife to smear some of the paste on the bottom right corner of the tag, leaving it very textured looking. I also added some on the middle left of the tag. 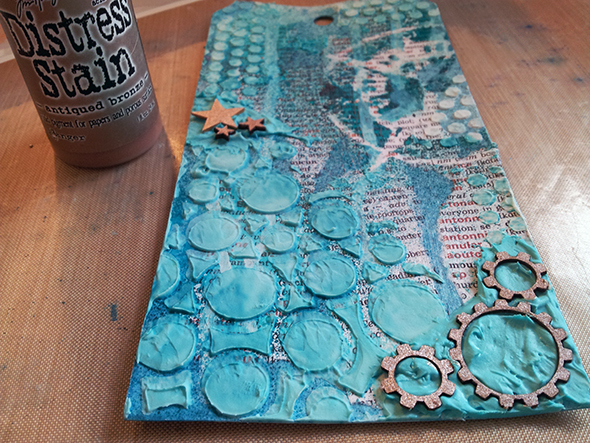 Into these sections of texture paste I pressed in some chipboard shapes – cogs and stars. 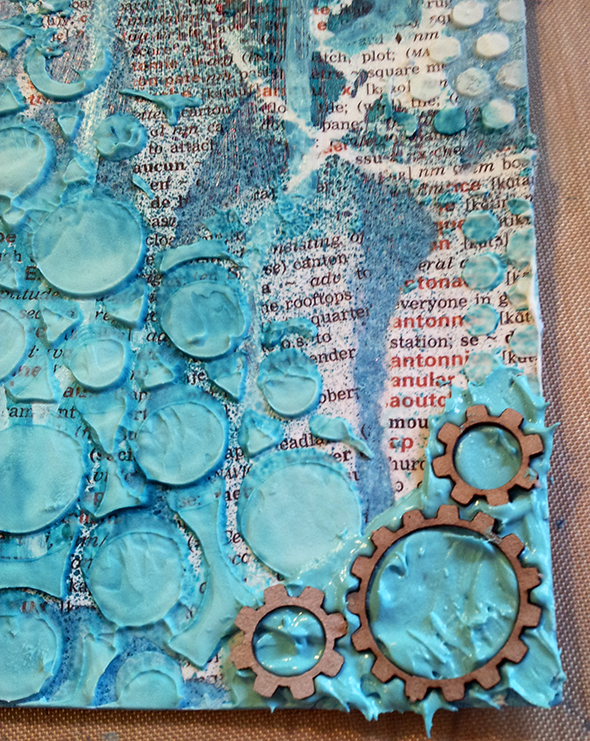 As the paste dries it keeps the shapes stuck in it as if glued in. 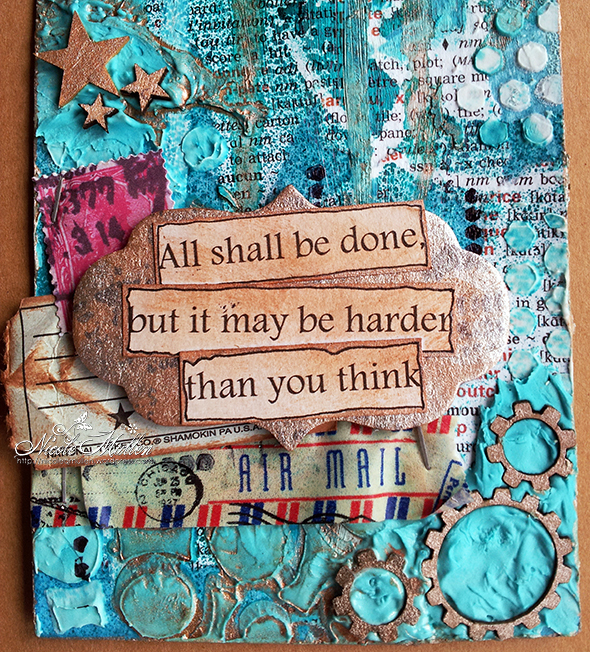 I had planned on keeping the shapes natural chipboard but decided to paint them using Distress Ink in Antiqued Bronze. I used some watered down Antiqued Bronze distress stain to add some bronze drips down the tag also. Now came the embellishing stage! I stapled on a strip of washi tape and layered on some tickets, stamps and a chipboard shape with printed text added to it. 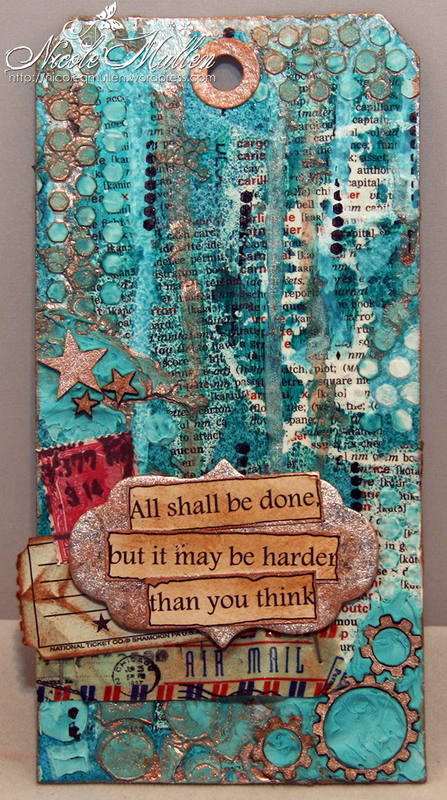 Everything was aged with distress inks or the bronze distress ink. 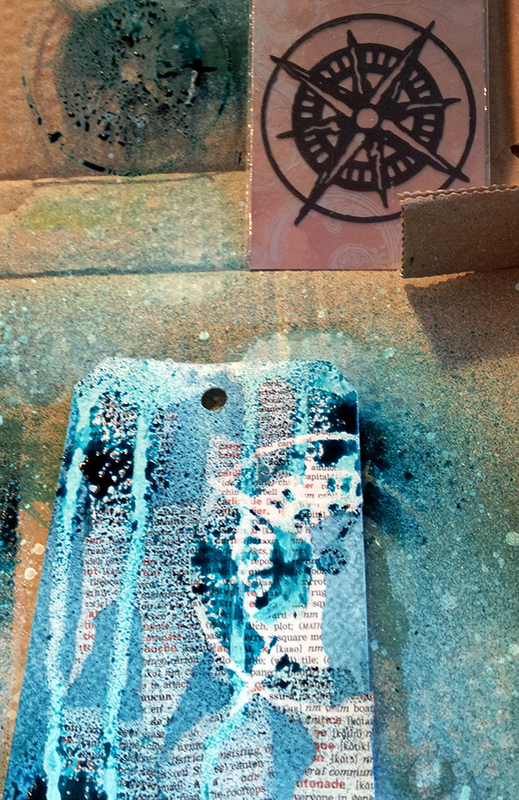 I also randomly stamped some hexes onto the tag to mimic the hex stenciling. 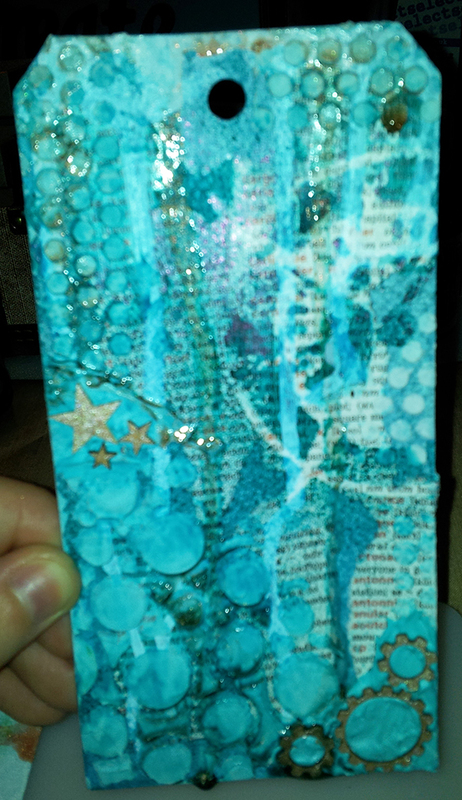 Here you can see a close up of the embellishments all added on…. And the completed tag…. I hope you enjoyed seeing this process and that you will give it a go – just relax and have fun with it! !